It was the large tree stump near the sidewalk at the front of their property that first caught his eye. Faron Young and his wife Joyce had just moved into their home in Springhill, NS; he began to study the stump, its lines and angles, and within a couple of years, he knew exactly what to do with it. But even Faron, a wood carver for more than 30 years, couldn’t predict what would happen after he carved his vision of a wood spirit into the street-facing side of the trunk, along with the words, ‘Touch for luck, health, fortune.’ Neighbours worried it would be vandalized but after three years, the wood spirit has inspired only curiosity, even devotion. The couple moved to Springhill in 2008, where Joyce was born and raised, after she retired from teaching in Ontario. Word of Faron’s talent spread, and this past summer he carved two more wood spirits around Springhill, one at the golf course and another in front of the Anne Murray Centre. 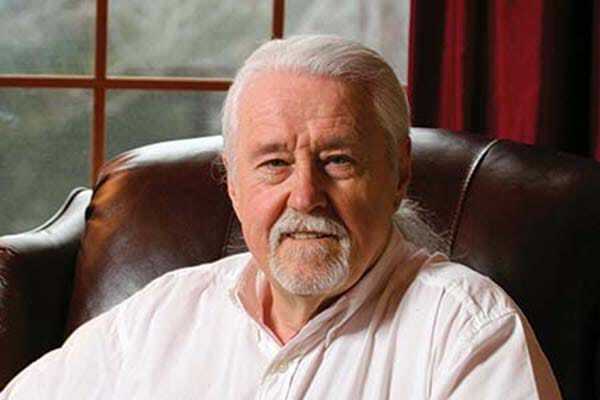 The story of Faron’s spiritual connection to trees and his woodworking talent begins with his childhood in Newfoundland. It’s hardly surprising, then, that Faron’s first carvings were of boats. As an aero-engine technician with the military’s Search and Rescue squadron, Faron and Joyce and their two daughters moved around Canada, before he retired in 1994. In 1986 they were stationed in Summerside; that’s where Faron began carving, to pass the winter, doing boats and clocks then moving on to birds. Wood carving in Atlantic Canada is as diverse as the people wielding the chisel or chainsaw, from finely detailed birds and decorative plaques to whimsical folk art people and creatures. Popular now with both men and women, it can be a solitary pursuit so most carvers join a club as much for the camaraderie as the sharing of ideas. 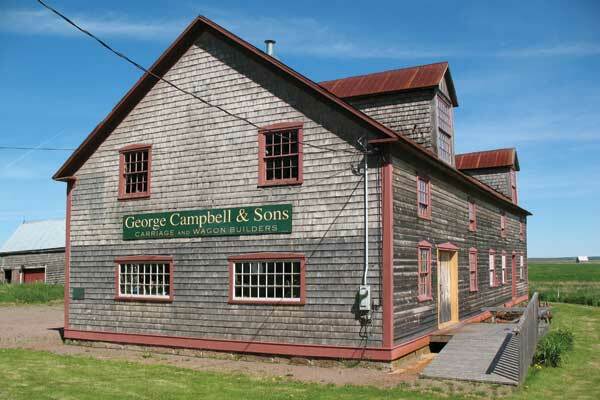 During his Summerside posting, Faron and a couple of other carvers, founded the Prince County Carvers Association, one of two clubs on the Island. The other club is in Charlottetown and among its members is Jim Jenkins, president of the PEI Wildfowl Carvers Association. Jenkins began carving in 1983 to relax after a demanding workday. While his club began as carvers of ducks and birds, members realized they had to adapt to meet new members’ interests and other carvers. Like Faron, Danny Beaulieu’s earliest creations were influenced by childhood memories. “My grandfather was a fishermen and my first carving was of a fishermen mending a net,” said Danny, who lives in Grand Falls, NB. Danny, too, founded a club in order to learn more about carving as well as help others pick up the craft, adding that carving is easy to get into because it isn’t costly. “You don’t need a lot of tools to get started,” he said. While the 35-year-old Northern Wood Carvers Association welcomes all styles, Beaulieu said the 30 regular members carve plaques and figures of people and animals. He’s particularly delighted that the majority of his club members are women, who bring a different perspective to carving. In Atlantic Canada, the three largest competitions are in Dartmouth, NS, in May; Stratford, PEI, in July; and in St. Andrews, NB, in August. Competitions and shows also provide an opportunity to encourage others. Faron brings along the first duck he ever carved so that when someone picks up one of his wood spirits or Santa carvings and says, “I can’t make that,” he answers, “You probably can’t make that but you can make this,” and he shows them the early duck carving. Faron’s shift from ducks and birds to Santas and wood spirits more than two decades ago happened simply because he decided to carve a Santa for Joyce for Christmas—and hit a previously untapped vein of creativity. His carvings are influenced by the Old World style of woodworking, which he discovered while visiting Germany during his military service. Switching to the folk art style of carving added a new level of partnership for the couple who have been married 35 years: Joyce is now the painter of Faron’s creations. Fortunately, the former convenience store next door was vacant and for sale, so Faron bought it and turned it into his workshop. Now the basement is only cluttered with Joyce’s paints, brushes and finished carvings waiting to be transformed into colourful pieces of art. They were first invited to the Lunenburg Folk Art Festival in 2009 and every year since, Faron and Joyce arrive with at least one new carving. The old salts remain popular, as do the jelly bean houses, inspired by the originals in St. John’s. For the 2015 show, they added nativity sets in the folk-art style. What Joyce enjoys most about the shows are the people they meet. “Every time we sell a carving, the person buying it tells us a story. They tell us why they want it and where it’s going. It’s never a fast sale,” she laughed. When one considers what goes into each carving—the materials and hours, as well as those intangibles of instinct and inspiration—it’s reasonable to expect a high price on the larger pieces. Those happen to be Faron’s favourite carvings: the Cypress Santas. 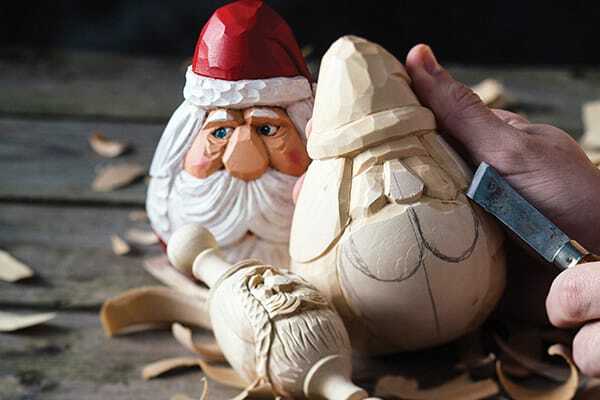 Sometimes a simple turn of the wood reveals the true Santa lurking within the raw material. Joyce wouldn’t let him sell that one so it sits year-round in their living room, along with Faron’s carvings of a Great Blue Heron, a mountain man, and a five-foot high Stick Santa, as well as an elaborate soapstone carving of giraffes that Faron brought back from Zimbabwe in 1995 when he was there as part of a team of technicians repurposing decommissioned Buffalo airplanes for humanitarian aid. According to Faron, his carvings have found new homes around the world, and one of his Stick Santas sails the Caribbean on a catamaran. The Stick Santas are perhaps his most popular and unique carving. They are made out of alder branches he and Joyce gather when they are in Newfoundland visiting Faron’s family. “When I’d go over in the spring to spend time with my father, we’d go into the woods and one year, I cut an alder branch. I looked at it and thought I could try something,” explained Faron about the origins of the three-legged Stick Santa.